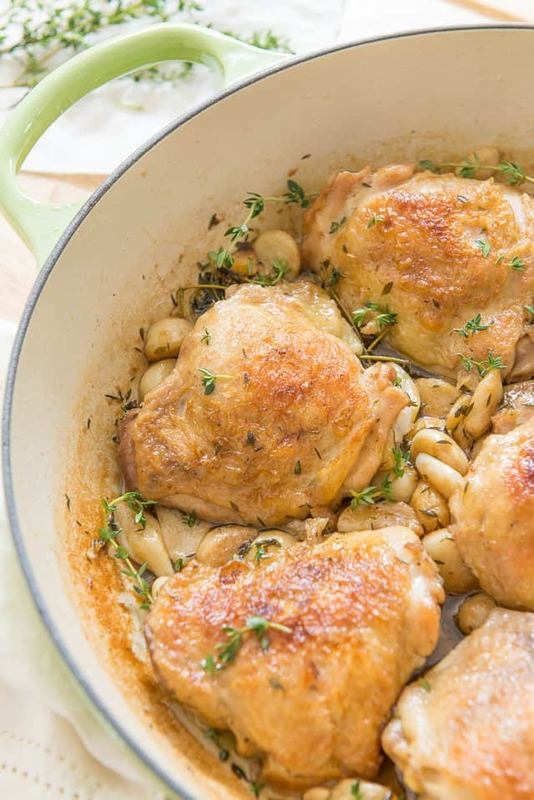 This 40 Clove Garlic Chicken recipe is an easy and delicious meal for dinner. Chicken is braised in an aromatic sauce with garlic, brandy, and fresh thyme. 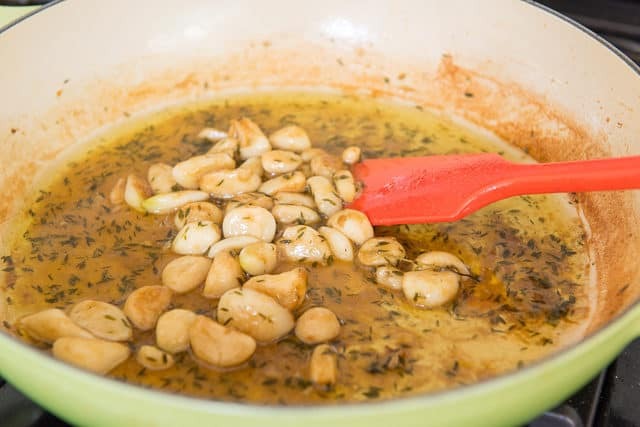 Forty cloves of garlic might sound like a lot, but if you’ve never had mellow and sweet garlic cooked like this, you’re in for a treat! Garlic in its raw form can be quite spicy and strong, but the garlic here is quite the opposite. It’s similar to roasted garlic, and has a very soft texture and mellow flavor. 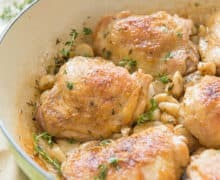 This garlic chicken dish is one of my all-time favorites. The flavors go so beautifully together, and it’s all made in one pan. I even serve the chicken right in the pan I cook it in. If I had to characterize this recipe, it’s definitely all about the aromatics. 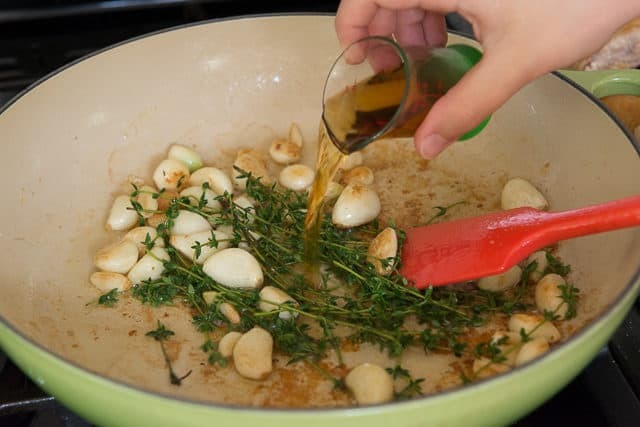 Fresh thyme, garlic, and a little bit of Brandy are the stars of the dish, and since chicken takes so well to other flavors, it picks up all those flavor notes and aromas. It’s also a very comforting dish, but in a way that’s healthier than most of the recipes you’d think of as “comfort food.” It’s gluten-free, dairy-free, and low carb friendly. Remove the chicken to a plate. There should be plenty of brown bits and chicken fat leftover in the pan. 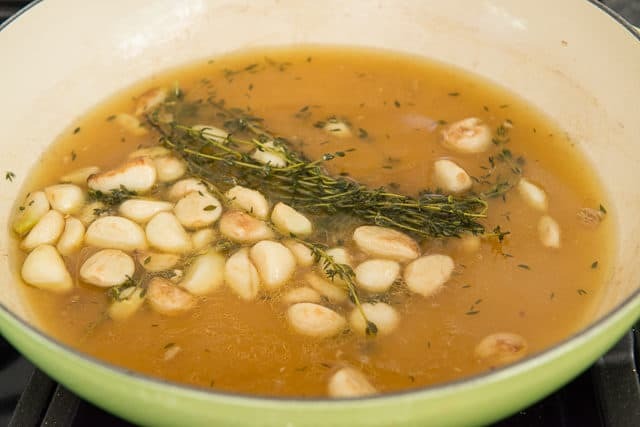 It adds a great flavor and aromatic quality to the dish, but if you wish to omit the alcohol, you can substitute chicken stock. 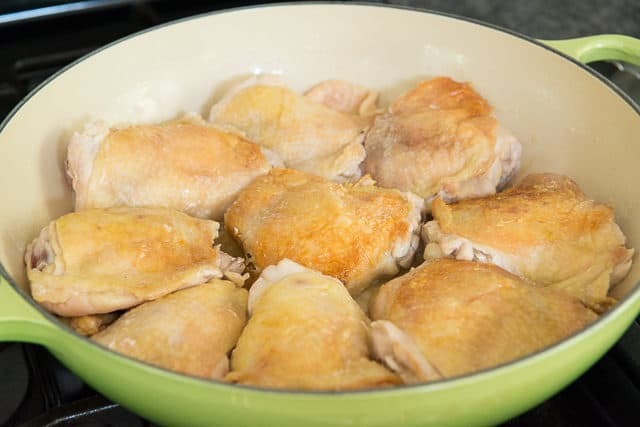 Add the chicken back to the pan, cover with a lid, and cook for 20 minutes, until the chicken is fully cooked to a temperature of 180F inside. Once again remove the chicken from the pan, this time to a baking sheet. For comforting, rich sides to serve with the chicken, I recommend Potato Gratin or Crispy Smashed Potatoes. For lighter sides, I recommend Charred Broccoli, Zucchini Ribbon Salad, or Zucchini Fritters. Enjoy! 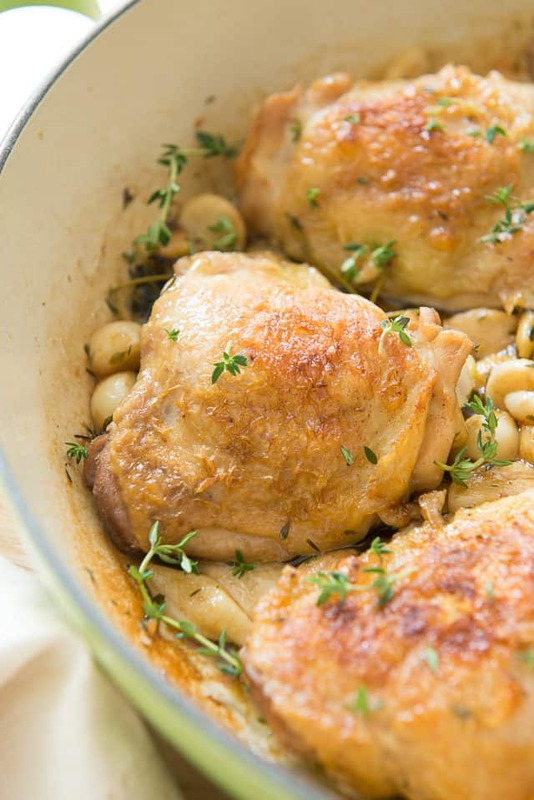 Chicken with 40 Cloves of Garlic is a delicious recipe for any dinner! Chicken is simmered in an aromatic sauce with garlic, brandy, and fresh thyme. Pat the chicken skin dry with paper towels, then season the chicken on both sides with salt and pepper. 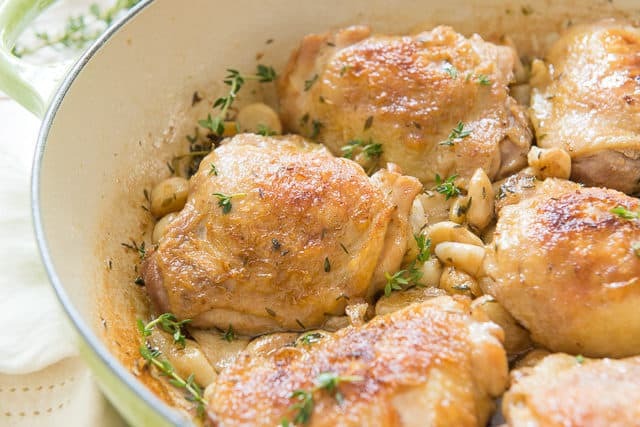 Heat a braiser pan or high-sided saute pan with a lid over medium heat, and add the chicken thighs skin-side down. Cook for about 5 minutes, until fat has rendered and the skin is golden. Flip and cook the chicken for 3 minutes on the other side, then remove all the chicken to a plate. Add the garlic to the pan, and saute for 5 minutes, until golden. Add the thyme and cook for another 3 minutes, until the thyme has wilted. Cover with a lid, turn the heat to medium low to maintain a gentle simmer, and cook the chicken for about 20 minutes, until the interior temperature is 180F. 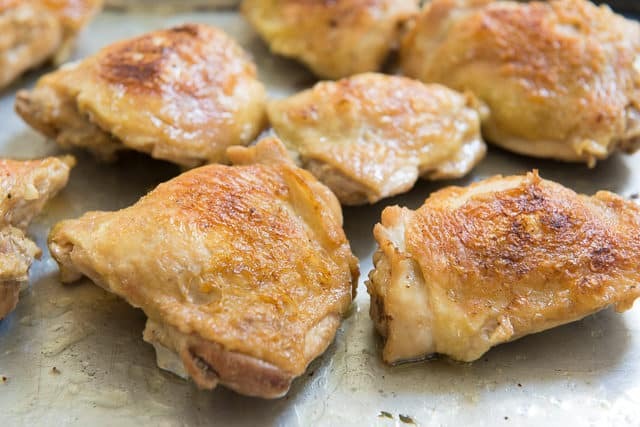 Remove the chicken to a sheet pan, and place the chicken skin side up under the broiler for a few minutes, until golden brown and crispy. Make sure to watch closely so the chicken doesn't burn. In the meantime, cook the sauce over medium high heat to reduce the braising liquid, until slightly thickened. Serve the sauce and crispy chicken together. Enjoy! *Nearly all grocery stores now sell pre-peeled garlic, which makes this dish really easy since all the work is done for you. 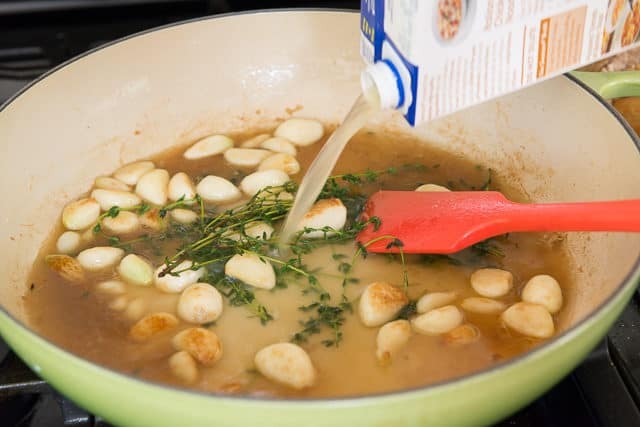 If you want to use actual bulbs of garlic, you'll need about 3 for 40 cloves. 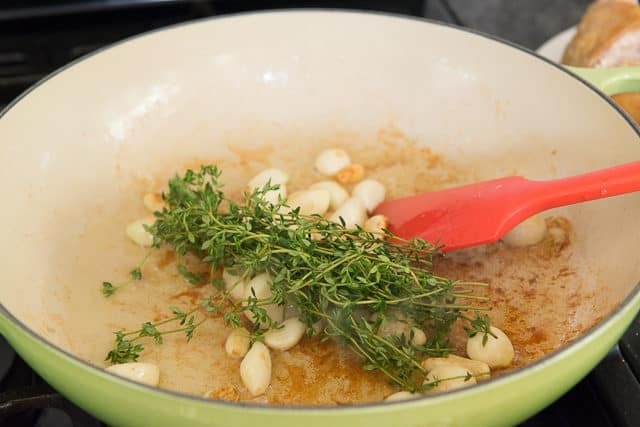 Separate the heads of garlic into individual cloves and blanch them in boiling water for 1 minute. Remove the garlic and peel (if they don’t peel easily, stick them back in the water for 30 seconds). **I like to incorporate more of the chicken skin's flavor and fat into the sauce, so I place the chicken skin side down. It takes a little extra time to crisp it again under the broiler, but it does work. If you want more crispy skin, cook the chicken skin-side up. Post updated with new photos, writing, and recipe in August 2018. Originally published April 2011.